There are little things more unsettling than zombie Nazis rising from calm waters somewhere off the coast of Florida. These top secret storm troopers cannot be stopped once they’ve risen from the depths of Hell’s ocean. Shock Waves, one of the handful of “sleeper” horror films from the late 1970’s, is an intense little film that manages to be quite effective in spite of its lackluster budget and age. Directed by Ken Wiederhorn, Shock Waves opens with the rescue from a very sunburnt survivor (Brooke Adams) of this Nazi madness. Her narration guides us back to the beginning of her undead ordeal. Aboard a commercial pleasure yacht, a small handful of tourists soak up the sun, arguing as they go about their business. The aging captain (John Carradine), first mate Chuck (Don Stout), and chef Dobbs (Luke Halpin) are about ready to throw their “guests” overboard, annoyed at their constant worry and bickering. Keith (Fred Buch) and a married couple (Jack Davidson and D.J. Sidney) join Rose (Adams) in a collective worry after witnessing a powerful orange haze take out the yacht’s navigational system. Their fears are cemented when the boat – during the night – collides with a ghost-like ship that suddenly appears. The next morning, the passengers awake to discover the yacht is taking on water and their captain is missing. They head to the nearest island and are greeted coolly by an old SS Commander (Peter Cushing) who demands they leave immediately. Refusing to help them, the group suddenly discover their vacation is over as – one by one – they are killed by mute and decaying Nazi “Death Corps” zombies. There is something otherworldly about Shock Waves. It is like listening to Gentle Giant’s prog-rock “Acquiring the Taste” for the first time. Atmospheric and wickedly arranged, the film is one long hallucination. 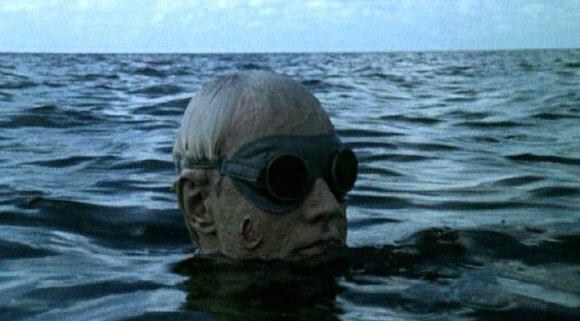 Several scenes are quite effective in eliciting emotions – especially the scenes featuring undead Nazis, with nifty black goggles, rising from still water. They don’t speak but, damn, if they don’t terrify with their rigid movements. Cushing might not have a lot to do but run from here to there on his tropical island but his presence, especially when he explains what the zombies are, helps to elevate the film. Even Carradine, who isn’t in it for very long, adds a spark to the chaos as the cranky captain at odds with his passengers. Actually, the acting – even from the novices – is quite good; there’s little to complain about. The unsettling atmosphere, rich with underwater zombies and sharp cinematography, keeps Shock Waves afloat as its macabre casts its spell. The film is so very intense – Nazi zombies behind doors, unmoving but close enough to kill - and quiet at times that it feels, especially in a modern day viewing, very voyeuristic. It’s as if we weren’t meant to see Shock Waves at all. This experience is aided by Blue Underground’s restoration efforts. Heavy on the grain, the film is presented with a bit of a rugged polish as it was transferred and fully restored from the only known surviving materials, straight from the director’s personal collection. Before Fulci’s Zombie and Romero’s Dawn of the Dead, there was Shock Waves. Zombie enthusiasts will want to add this gem to their collection of undead titles. Tagline: Once They Were Almost Human! Beneath the living... Beyond the dead... From the depths of Hell's Ocean! The Deep End of Horror! Memorable Movie Quote: "We created the perfect soldier"
Synopsis: Visitors to a remote island discover that a reclusive Nazi commandant has been breeding a group of Zombie soldiers. Blue Underground first released Shock Waves on DVD in 2003, and the transfer was taken from the director’s own vault print since the original negative mysteriously disappeared, so the film seemed an unlikely candidate for a Blu-ray facelift. Now freshly transferred and fully restored in High Definition from the only surviving materials, for a film shot in Super 16mm and blown up to 35mm, it looks quite nice and greatly improved over the previous DVD. Presented in 1080p and in the original 1.85:1 aspect ratio, detail is greatly improved, especially in the daytime outdoor scenes and underwater scenes, which now have a good amount of depth to them. Naturally, grain is present and heavier in some of the night-time scenes, but never excessively problematic, and colors have a nice saturation to them. The audio is presented in a DTS-HD 1.0 option and is well balanced, with sound effects and music coming through fine and dialog being clear. Optional subtitles are included in English SDH, French and Spanish. A commentary with director Wiederhorn, make-up man Ormsby and filmmaker Fred Olen Ray is included. All three share some fun stories about Cushing and Carradine (who were on the set for less than five days each), as well as the other cast members, the locations and the filming conditions. 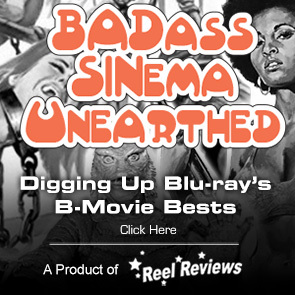 Premiering on this Blu-ray are three new featurettes. The best is a solid interview with producer/cinematographer Reuben Trane. Trane begins by saying that the zombie scenes were the best bits in the movie, and about first hitting it off with Wiederhorn (they made their student thesis film together) and how they decided to collaborate on a “real” project. The next is an interview with composer Richard Einhorn, who expresses his love for horror movies and wanting to do something very different with the music for the film, which was his very first feature. Brooke Adams is interviewed for the final new featurette. Picked up from the DVD release is an interview with actor Luke Halpin, who at the time of the interview, looked pretty much the same as he did in the film. The former "Flipper" star (who later found work as a stuntman) shares his memories of working with old pros Cushing and Carradine, and co-star Adams and it sounds as though he had a great time making it. Also included are the original U.S. trailer, a TV spot, and two radio spots. The photo and still gallery is most impressive, showcasing not only behind-the-scene pics, but also original newspaper and drive-in theater ads, video artwork, personal production items from Wiederhorn, the original zombie design art and more.